JRPG Jungle: Child of Light - Coming to PS Vita in July! If you didn't have a chance to feel how fitting Child of Light was on PS Vita via Remote Play on PS4, never fear! Child of Light is scheduled for downloadable release on PS Vita! It's a great game for the Vita with it's explorable world and the chance to use the little ball of light Igniculus in touch screen mode (this was in the remote play - I hope they keep it in the Vita release!). Details for the RETAIL version of Child of Light on PSVita: 1) Not a Dwl code. 2) Price is 24,99 Euro. 3) Not planned in NA. Of course, it is Twitter and not officially announced by Ubisoft, but that's pretty exciting! If you're in North America, PS Vita games are usually region free so I'm sure you could find it online once pre-orders are available. The game is due out July 1st in North America and July 2nd in Europe. 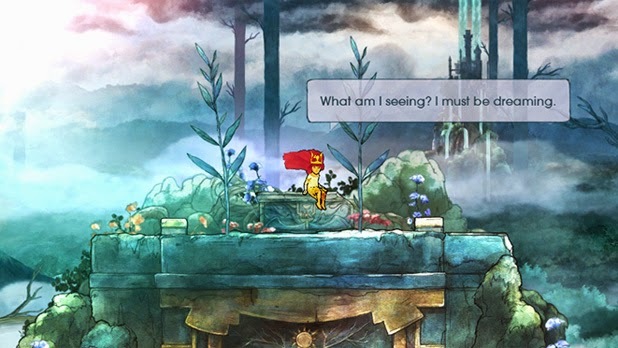 I gave Child of Light a 9.6/10 in my recent review which you can read here.